Ever tried burrata cheese? 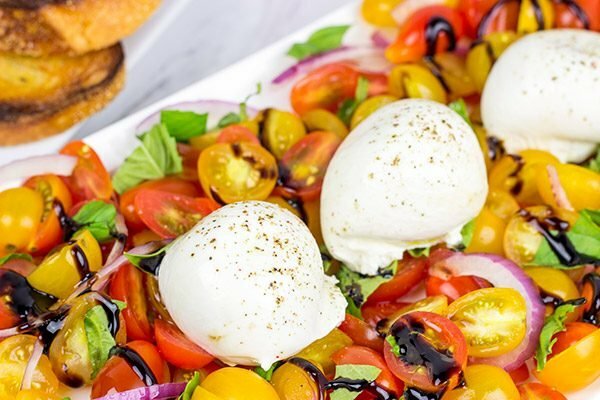 It’s in the mozzarella family, and it makes for a great centerpiece of this Tomato and Burrata Caprese! There’s somewhere around 7.5 billion people in the world. That’s a lot of zeros. And there’s somewhere around 320 million people in the US. That’s still a lot of zeros. But despite these numbers, the world has a strange way of being a small place. Case in point: Belton, South Carolina. As I’ve mentioned before, I grew up in Charleston, SC, and my sister and I spent the better part of our summers either selling lemonade in Charleston or romping around our grandparent’s huge backyard in Belton. But back to the world is a small place story. It turns out Erica grew up in Charleston, SC, too. So we certainly had plenty to talk about there. When Erica made the move from Pittsburgh up to our area, her Mom came up with her to help her settle in. We offered to take them out to dinner one night, and so we all piled in the car and headed up to our favorite brew pub in Saratoga. On the way up, we got to chatting about Charleston and growing up in the South. Erica’s mother mentioned that she grew up in a small town in upstate South Carolina near Anderson. Wait. What town near Anderson, SC? Sure enough, her mother was born and raised in Belton. The same Belton where my grandparents lived for their entire lives. And to put this all in perspective, Belton has a population of around 4,000. Yeah, not that many zeros. What are the odds that we would end up in a car way up here in New York with someone from Belton, SC? Slim at best. But it happened! Needless to say, we’ve become great friends with both Erica as well as her parents. Whenever they come up to visit, we often get together at least 2-3 times to hang out and eat delicious food. On their last trip up, they mentioned they found burrata cheese at our local grocery store. 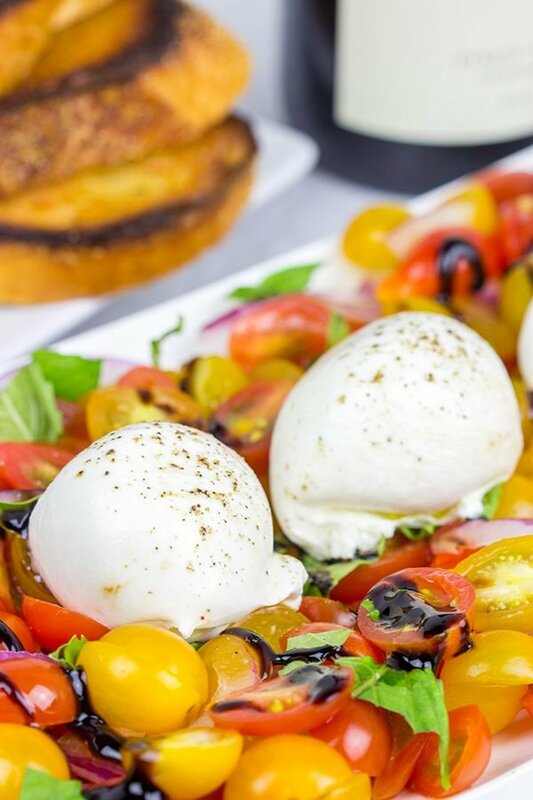 I wasn’t familiar with burrata, but they told me that one of their favorite appetizers at Carrabba’s Italian Grill is a tomato and burrata caprese salad. I was intrigued. So during these cold winter nights, whip up this Tomato and Burrata Caprese as a fun appetizer for friends and family. 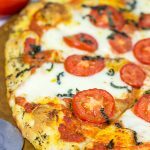 (In truth, we turned this into dinner one night…with a glass of red wine and plenty of toasted Italian bread!) Enjoy! Arrange halved tomatoes on a plate. Top with red onions and basil leaves. Drizzle with balsamic glaze. Place burrata cheese in center of plate. Drizzle olive oil over both burrata and tomatoes. Garnish with freshly ground black pepper. Such a great recipe David 🙂 Loved reading it!! you have platted it very well ,It looks so delicious!! I am wondering if the burrata cheese would be available here. I will have to check it out. BTW, David, this salad sounds amazing, so easy and simple recipe. I really love the way you have topped the burrata cheese over it. I’m a huge lover of burrata, it’s creamy and firm and has a particular flavor that I can’t get enough of. I love when parents come into town, it always gives me an excuse to show off some of my favorite local restaurants. I’m pretty adventurous with food, and so is my Mother, so we have found ourselves having some unique dining experiences. Those tomatoes look bright and fresh; I think I’m going to make this salad this weekend, the perfect way to jump start my clean eating in 2017. I totally agree, Mary! It’s kinda fun having guests in town since you can be a tourist in your own backyard. You know…do all of those things you keep saying you’re gonna do, but never actually do. 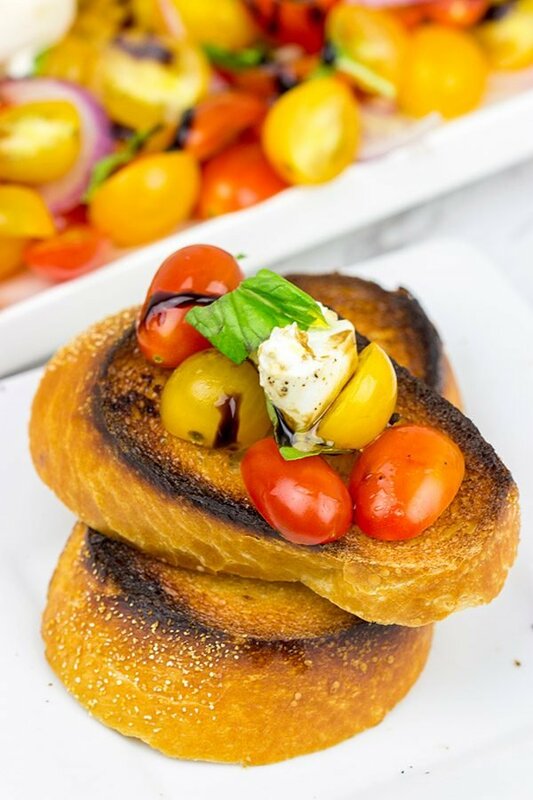 🙂 This was a super easy appetizer to make…and that burrata! I am a huge fan now! Hope you had a great weekend, my friend! Indeed! Delicious, buttery texture and goes with so many good things from cold to hot. 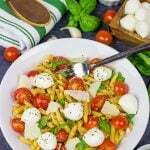 Love it in salads and on pasta dishes. Beautiful colors and even though it’s breakfast time here I’d go all in if I had a fork right now. Have great weekend Dave! Thanks so much, Kevin! I am a huge fan of burrata now, and I’ve been playing with it in all sorts of new ways. I think you know how much we love Italian food over here, too! We did indeed have a good weekend, and I hope you guys did, too! I hear you’ve got some rain out there in California right now…stay safe! Sometimes….almost all of the time…less truly IS more- don’t ya think? Tell me about your balsamic glaze….do you make it? Store bought? Hoping that I can find the burrata at our local dairy (https://m.facebook.com/PittsfordFarmsDairyBakery) that carries all things delicious! 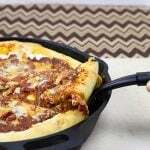 I’m with you, I love turning appetizer dishes like this into dinner with wine & bread! So good. 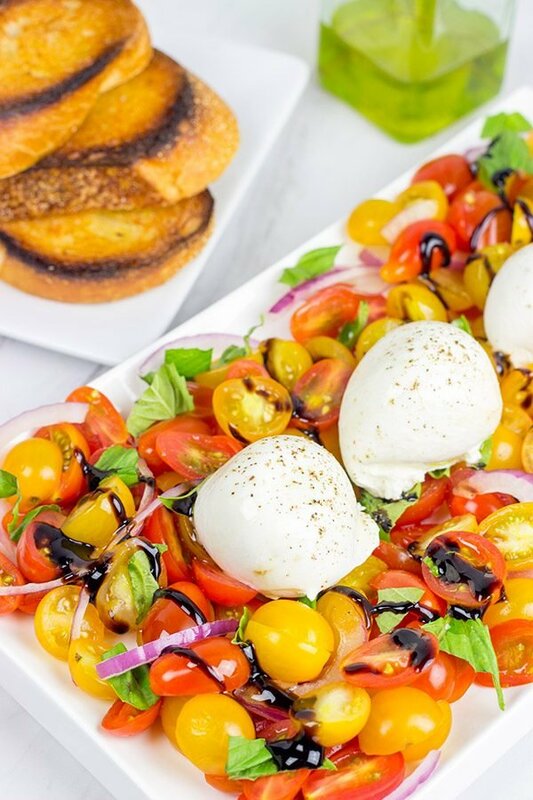 Caprese is one of my go-to appetizers for sure! Yes! Appetizers for dinner is so fun. Especially when it’s really cold outside and there is a fire in the fireplace. And even more so when a nice glass of wine is involved, too! 🙂 Thanks so much, Nicole! Happy New Year to you, too! I love how your blog is a pull of the places youve lived/been and the experiences youve lived. So beautiful David – and so is this recipe! Such a delicious spread David,Amazing !!! I love burata, especially on salads. Thanks for the recipe. Sometimes, fresh mozzarella is a good substitute, but sometimes, a poached egg is an interesting stand-in. A poached egg, eh? Now that is an interesting stand-in for burrata! But I can see how it would work. Thanks for the tip, Jeff. Hope you had a great weekend, my friend! I have never tried burrata but have definitely heard about it! sounds delicious, can’t wait to try! A good soup opera could be based on your stories, David (Like 300 episodes, not less haha). Look, what’s the major plot of this stuff (just guessing indeed). Right – everyone knows each other (but up to some point they don’t know this yet). But you’re right – sometimes there are too many numbers. Which is why I’d like to live in a small town like with…4000 people. Do you think this would work? :) And thanks for this delicious refreshing salad. A littlr of summer is excactly what we need now. Hello David!! Here we said that the world is like a hankerchief! and at any moments its corners can be join! Loving this salad!! What a fun saying, Gaila! I love that! But you’re right…the world has a strange way of being a really small place. 🙂 I hope you had an amazing weekend, my friend! Inspite of all those zeroes – it’s such a small world indeed! Love how this connection not only made the world smaller for y’all but made it bigger at the same time by bringing burrata into your lives! 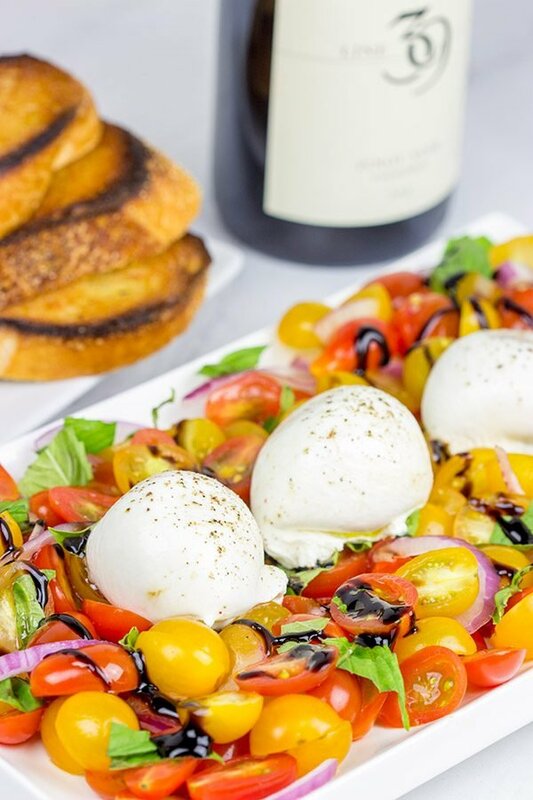 I’ve never had burrata but have seen it pop up on quite a few blogs I read – it sounds so decadent – perfect in this salad! You know…that’s a good point, Shashi! Who would’ve thought that we’d meet someone with such a similar geographical background. But they did indeed introduce us to burrata. Burrata is so close to mozzarella cheese…I’ve been calling it “magic mozzarella”. 🙂 Hope you guys had an awesome (and not too snowy!) weekend down there in the south! Dude, what a turn of events- Out of all the people in the world (As it’s ever increasing!) you managed to cross paths with Erica (or Laura, rather)- That is incredible. They say that everyone has a doppelganger or something like that- I wonder if we’ll see ours soon! In the meantime, we shall faceplant this Caprese- I LOVE burrata instead of boccacini.. I swear its the salt ha! You know, that’s a good point, Arman. Erica’s path wouldn’t have crossed mine if it wasn’t for Laura. What a freakin’ small world it is! But speaking of doppelganger, what would you do if you were walking down the street and ran into an exact copy of yourself. Like Arman 1 and Arman 2. That’d be pretty epic!